Chester/Deep River Boy Scout Troop 13 celebrates three new Eagles Scouts. From left to right, James Rutty, Samuel Rutty, Zane Bouregy. Photo by Michael Rutty. 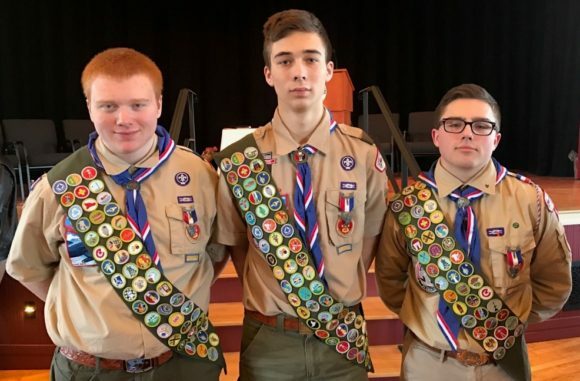 CHESTER/DEEP RIVER — Troop 13 – Boy Scouts of America would like to congratulate two Chester brothers and one Centerbrook resident on earning the rank of Eagle Scout. These Eagle Scouts completed projects in the towns of Chester and Haddam Neck. All the work completed benefits residents and visitors to both towns. To become an Eagle Scout, a Boy Scout must earned 21 merit badges and advance through the seven scout ranks by learning Scout and Life skills while simultaneously providing leadership to his Troop and service to his community. One of the final requirements for the Eagle Rank is to show leadership in and complete a service project that benefits the Scout’s community, school, or religious institution; all of this work must be completed prior to the young man’s 18th birthday. James H. Rutty’s Eagle Scout Service Project involved developing and implementing a plan to construct a prayer garden patio with benches and peace pole at the United Church of Chester, allowing residents and visitors a place for quiet reflection and prayer. James was awarded the rank at a joint Eagle Scout Court of Honor Ceremony with his brother Samuel on March 18, 2017 at the United Church of Chester. Since joining Troop 13, James has earned 85 Merit Badges. James is a junior at Saint Bernard School in Uncasville, CT.
Samuel M. Rutty’s Eagle Scout Service Project involved developing and implementing a plan to raise funds and construct twenty eight foot wood and concrete memorial benches at the Haddam Neck Fairgrounds, providing attendees a place to rest and enjoy the fair. Sam was awarded the rank at a joint Eagle Scout Court of Honor Ceremony with his brother James on March 18, 2017 at the United Church of Chester. Since joining Troop 13, Sam has earned 70 Merit Badges. Samuel is a freshman at Saint Bernard School in Uncasville, CT.
Zane F. Bouregey’s Eagle Scout Service Project involved developing and implementing a plan to replace the flagpole, restore the veterans memorial at Cedar Lake and hold a rededication ceremony on December 28, 2016. Zane was awarded the rank at an Eagle Scout Court of Honor held March 19, 2017 at the Deep River Town Hall. Since joining Troop 13, Zane has earned 46 Merit Badges. Zane is a senior at Valley Regional High School in Deep River, CT.
We offer our congratulations to these fine, young men! Troop 13 Boy Scouts serves the boys ages 11-18 of Chester and Deep River. The purpose of the Boy Scouts of America is to help young men develop their character and life skills all while having fun. There is much emphasis placed on assisting these young men to develop into strong healthy citizens who will lead our communities and country in the years ahead. The Boy Scout methods help to promote these ideals through the challenge of putting them into practice with the Troop Program. This is done in a way that is both challenging and fun.